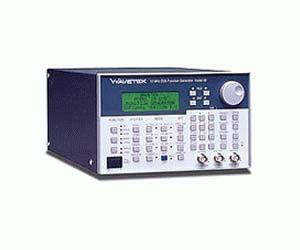 The 29 uses Direct Digital Synthesis (DDS) techniques to bring you a full featured, programmable 10 MHz function generator with arbitrary waveform capability. Loaded with features and affordably priced, the 29 includes both RS-232 and IEEE-488 (GPIB) interfaces for remote programming. Based on Direct Digital Synthesis techniques the 29 provides excellent frequency accuracy (10 ppm over 1 year) and stability (1 ppm/°C) with 7 digit resolution. Standard as well as arbitrary waveforms may be generated. Standard functions include sine, square, positive pulse, negative pulse, multi-level square, triangle, ramp up, ramp down, sin x/x, DC and pseudo-random noise. For multi-channel applications multiple 29s may be phase locked. Phase relationship between units is programmable. Operating modes including trigger, burst, gate, sweep, amplitude modulation, frequency shift keying (FSK) and frequency hop provide the versatility required for a wide range of applications. Nine complete instrument set-ups may be stored and recalled from battery backed memory for frequently used applications. The 29 bears CE marking for safety and EMC.